The Bone Dragon gets full review in the Guardian! Such a wonderful review from Linda Buckley-Archer. So energised to write now. Can’t wait for tomorrow when I get to dive into Chapter 2 on Book 3! Want to know more? I’ll be at Bookstock tonight (http://www.northlondonreadinggroup.co.uk/bookstock.php) – a few tickets left if you’re interested. Just confirmed with Faber that the publication date for The Bone Dragon has just been moved up to 4 April 2013! So excited… and now not quite so long to wait! Pre-order now from Amazon, Waterstones and WHSmith. Currently on offer at Amazon and Waterstones, so grab a hardback for a fantastic price while you can! BTW, book is actually 300 pages, not 240 – shortly to be updated on the relevant sites – so it is a full length novel! In a somewhat frantic bid to live up to my nomination for The Versatile Blogger award, here is a post on… er… food. Everyone eats, right? I know I promised a post on wedding cakes and that is coming, but it’s not quite ready yet so here’s my take on Pak Choi and Mushroom Chow Mein in my vague (“It’s about this much,” she says, tipping some cinnamon into her hand, glaring at it and then adding it to the tagine with a pinch… er, make that two… for luck) style of cooking. Very finely chop a 1-2 inch cube of peeled ginger root (if you really like ginger, go for a 2 inch cube, but probably a 1-1.5 inch cube will do it for most people) with 4-6 spring onions and 3 large cloves of garlic. If you like things spicy, add 1-2 finely chopped chillies and 1/3 of a stalk of fresh lemon grass. For a mildly spicy version, use 1 large mild red chilli and ¼ of a stalk of lemon grass. Heat 2 tsp toasted sesame oil in a wok until a tiny piece of ginger tossed in immediately starts to sizzle. Throw the ginger, garlic and spring onions in (and the chilli and lemon grass if you’re using any). Stir until the ginger is nicely golden (about 2-4 minutes). Season with pepper (ideally, ground Szchuan pepper). Add 250g washed button mushrooms (no need to chop unless they’re quite big) and 150g chopped shitake mushrooms (a small-ish dice is fine). 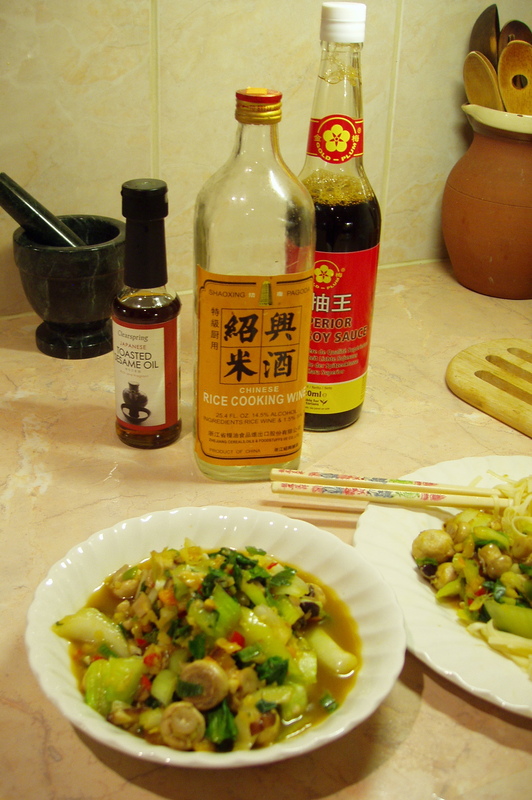 Add 3-4 tsp rice wine (or medium dry sherry at a pinch) and 3 tsp light soy. Stir for 2-4 minutes until the button mushrooms are starting to soften. Back to the veggie wok. Throw in 3-4 pak choi chopped into large-ish pieces (tip: they need to fit in your mouth comfortably unless you enjoy choking.). Cook for 2-4 minutes until the pak choi is al dente (still has a little crunch but isn’t raw anymore). Serve the noodles. Chuck the veg on top and taste. Add soy to whatever degree of saltiness you enjoy. General tip: if you’re not worried about the salt content of your meals, use dark soy. Start with about half the quantities above and then go from there. Remember, it’s easy to add more: taking it out, not so much. There you have it. A tasty (and, incidentally, low-cal), all natural meal. No nasty bottled or packaged sauces. Not too much salt. Very little fat. Tons of flavour.